From the leading publisher of Android books, Apress Expert Android gives you advanced techniques for customizing views, controls, and layouts. You ll learn to develop apps in record time using JSON, Advanced Form Processing, and the BaaS (Backend As A Service) platform Parse. 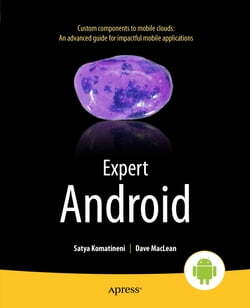 The book also includes... read more extensive coverage on OpenGL, Search, and Telephony. With these advanced and time saving technologies you ll be able to release compelling mobile applications in Google Play and the Amazon Appstore at a rapid pace. In Expert Android, you ll learn to: Borrow, reuse, or build custom Android UI components Create 3D experiences using OpenGL ES 2.0 Write collaborative applications in the Parse cloud and communicate with your app user community through Parse Push Technology Reduce the time-to-market while creating rock solid apps for multiple devices Whether you are an individual or enterprise developer, in Expert Android you ll findÂ the advanced techniques and practices to take your mobile apps to the next level. Regardless of the Android release, this book serves as your definitive, capstone reference for your Apress Android experience.